Is temperature dependence important for your binding interactions? In our hot new application note as we demonstrate how OpenSPR’s Temperature Control Add-On can be used to analyze the effect of temperature on the kinetics and affinity of a protein-protein interaction. Surface plasmon resonance (SPR) can be used to analyze all types of interactions including protein-protein, protein-small molecule, protein-nucleic acid, protein-aptamer, protein-lipid, carbohydrate-protein (carbohydrate-lectin), carbohydrate-carbohydrate and many more. Many scientists are implementing SPR to investigate the effect of temperature on the binding kinetics and affinity of biomolecular interactions, which can also be used to determine thermodynamic parameters. 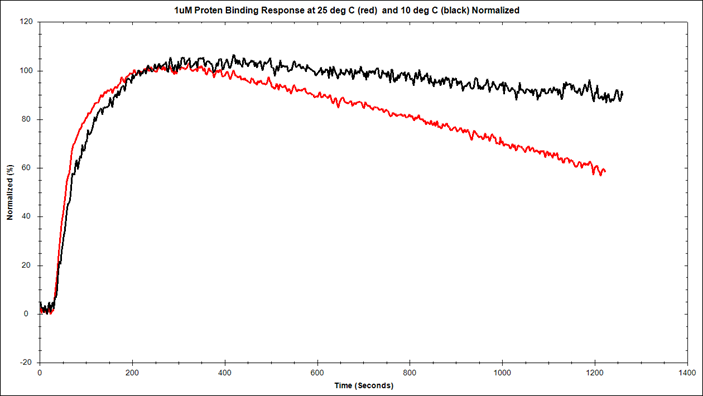 Direct comparison of protein-protein interaction at 1µM concentration at 30ᵒC (red) and 10ᵒC (black) using OpenSPR. Why do we study protein-protein interactions? Protein-protein interactions are important for biological processes at both cellular and systems levels. These processes include including gene expression, cell growth, cell cycle control, morphology, motility, intercellular communication and apoptosis. Studying how proteins interact with each other and identifying biological networks is vital to understanding how proteins function within the cell. Why do we study the effect of temperature on protein-protein interactions? At constant protein concentration, the kinetics of a protein-protein interaction is dependent upon temperature. As temperature increases, the association and dissociation rates increase as well. In general, proteins are more likely to start unfolding at high temperature conditions, causing the binding energy of the protein complex to increase. Temperature can affect protein-protein interactions in many ways including protein intermolecular interaction potential, aggregation, crystallization, and phase behavior. Why do researchers use SPR to characterize protein-protein interactions? Determining the binding kinetics and affinity of protein-protein interactions is important not only for understanding life at the cellular level, but also for studying disease and drug development. Techniques such as protein affinity chromatography, sedimentation through gradients, gel filtration columns, sedimentation equilibrium and fluorescence methods have been used to study these interactions. However, many of these techniques require complex labelling steps or expensive, complex instrumentation. Most of these techniques only give endpoint measurements such as yes/no binding or affinity. In recent years, many researchers have turned to surface plasmon resonance (SPR) to characterize their protein-protein interactions as a sensitive and quick approach that also provides real-time measurements. SPR is a label-free technology which allows researchers to quantitatively analyze binding between two biomolecules. SPR technology allows us to determine the kon, koff and KD of interactions, providing deeper insight into binding events compared to other techniques that only give endpoint measurements. This data is critical for characterizing binding systems and especially for drug design. Below is an example of how OpenSPR™ was used to analyze the effect of temperature of the kinetics and affinity of a protein-protein interaction by using the Nicoya Temperature Control Add-On. Using OpenSPR Streptavidin Sensor Chips, the interaction was analyzed at 30ᵒC and 10ᵒC. The binding kinetics and affinity were determined using a one to one binding model. The off rate was found to decrease by 40% as the temperature decreased from 30ᵒC to 10ᵒC. A decrease in the off rate is expected at lower temperatures, possibly due to a decrease in the random thermal motion of the molecules. This illustrates the value of surface plasmon resonance analysis in such applications as the strength of the interaction between protein-protein interactions. You can find the full study here.